June 13, 2017 April 2, 2019 - The 'Noms. 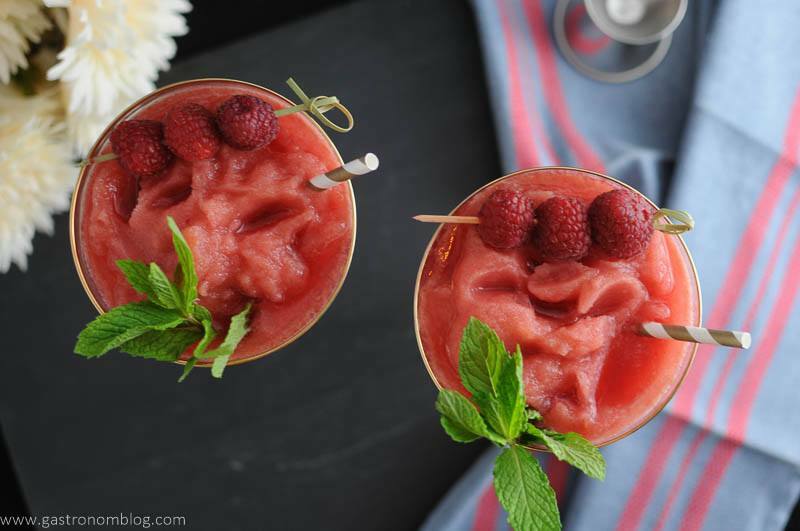 A perfect chilled and frozen watermelon raspberry frosé cocktail with perfect summer flavors! With the hot days of summer fully in effect, everyone looking for great ways to beat the heat. Why not turn to something fun, fruity and frozen? 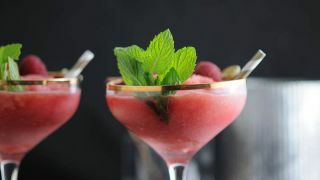 One of the big drink sensations sweeping the nation totally checks all the boxes for a great summer treat, the Frosé! 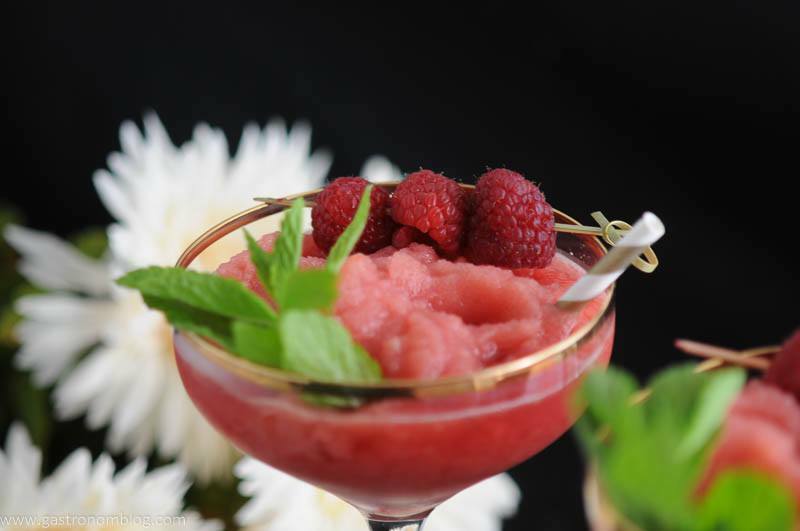 We came up with our take on this frozen drink, the Watermelon Raspberry Frosé. Simply put it has a catchy name for a frozen Rosé, a slushy concoction made by freezing that wonderfully pink wine that isn’t quite red enough to be a red and not white enough to be a white! Rosé is one of the oldest styles of wine, as it uses the ancient style of maturation. That maturation has some contact with the grape skins that comes from the simple pressing method used to break down the grapes. This leads to a lighter fruitier wine than the more modern red wines. In the not too distant past, Rosé had a little bit of a reputation as an uncool wine (it often was the choice of little old ladies), while the cool kids were all drinking bit bold reds and dry whites. But in the last year, Rosé seems to be making a comeback as more drinkers discover the European fashion of drinking Rosé in the summer! Of course, we also think there is another reason for the rise of the Rosé, the Frosé! We recently were playing around with watermelons for another summery watermelon cocktail.Of course we had some fresh watermelon around that needed to be used before we had to go out of town on some traveling. 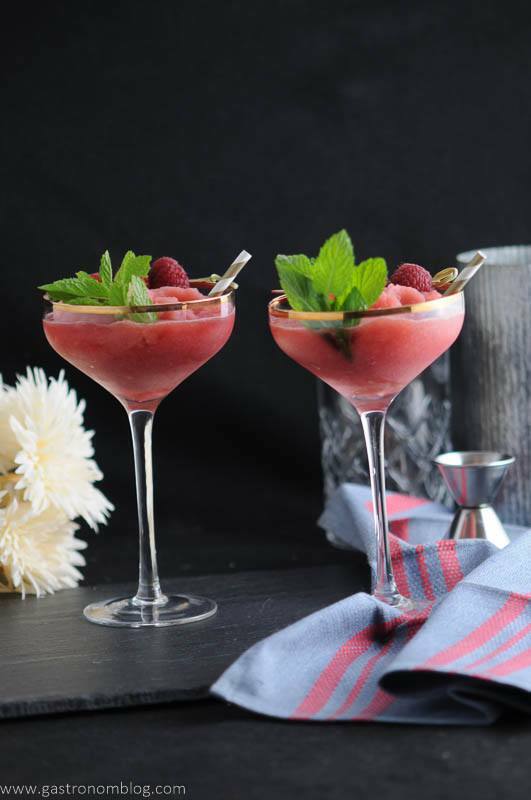 We had been kicking around making a Frosé as we love making boozy frozen desserts to have around our pool in the summer. So what better way to prevent a watermelon going to waste than freezing it to mix in our Frosé? We chunked out the watermelon into nice, easy to freeze chunks. Then we let them get nice and frozen while we headed off on our trip. While the watermelon chucks were freezing, we poured out a nice Rosé into ice cube trays and let them freeze. We knew that our trip to Kansas City (did you see our adventures on Instagram?) was going to be a warm one so both of us were looking forward to a dip in the pool when we got back. Of course a good lazy day relaxing in the pool needs a good drink! So we then had our Watermelon Raspberry Frosé in mind before we even left for our trip! 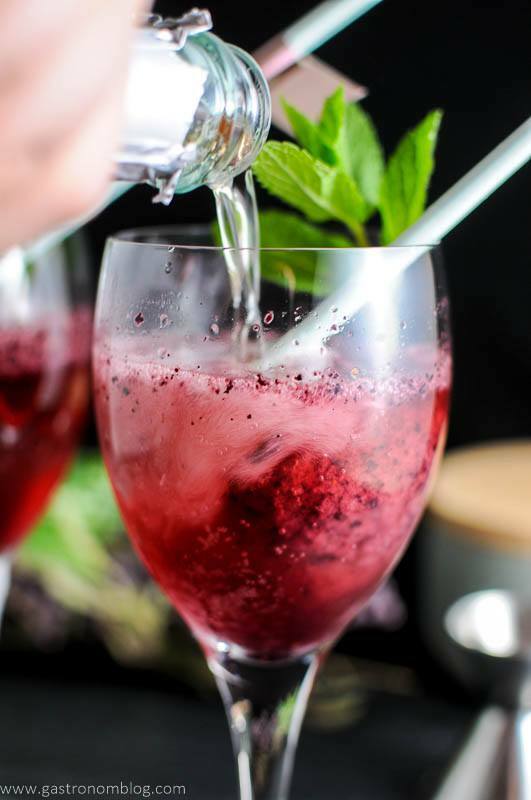 What Ingredients are Needed for the Watermelon Raspberry Frozen Rose Cocktail? Making our Watermelon Raspberry Frosé was really easy, throwing a couple chunks of the frozen watermelon, some frozen raspberries (store bought frozen raspberries are fine!) and the frozen Rosé cubes into the blender and giving it a pulse. Pulse until everything was smoothed down to a nice slush. If it gets a little thick and hard to blend, we recommend a slash or two of fresh squeezed lime juice to thin it out to make it easier to blend. 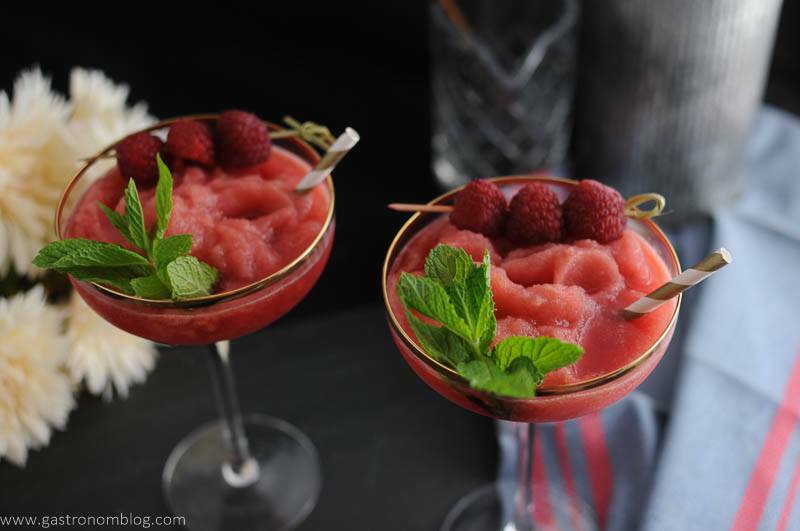 The lime juice adds a nice edge that really brings out the fruity flavors of the watermelon and raspberry. If you need a great way to beat the heat this summer, give our Watermelon Raspberry Frosé a try! Sweet, fruity and frozen, you will find sipping on this Watermelon Raspberry Frosé might just be the frozen treat for your summer! 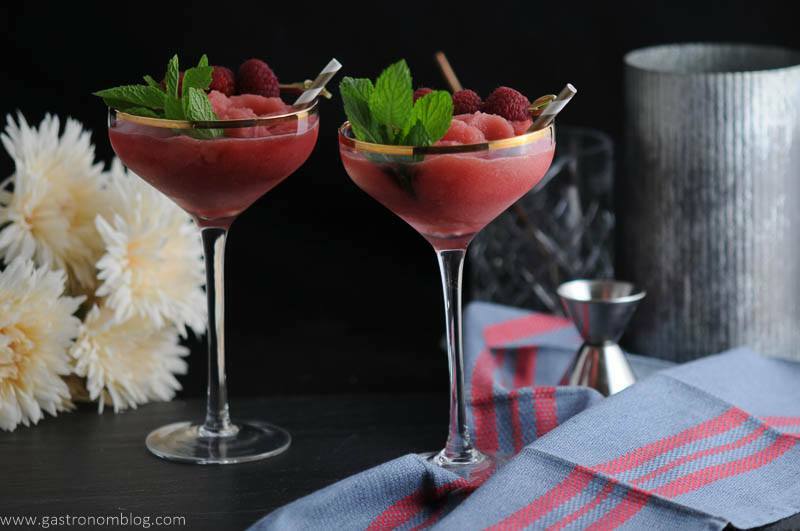 Watermelon and raspberry frozen rose as a summer cocktail to cool off with. Fill ice cube tray with rose wine and freeze. 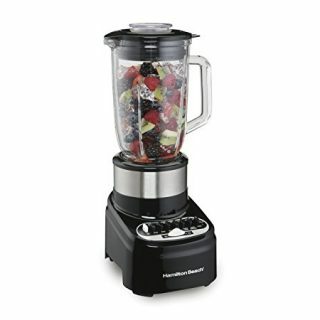 In a blender, add watermelon chunks, frozen raspberries, frozen rose and lime juice. 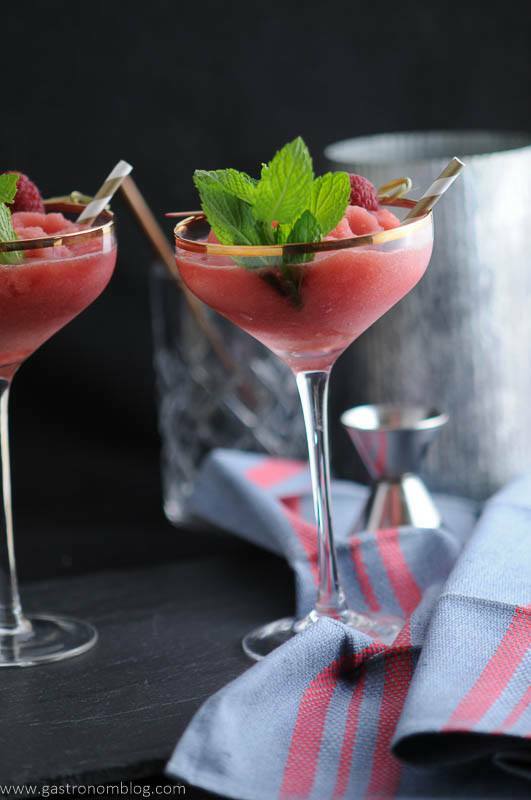 PIN THIS WATERMELON RASPBERRY FROSE RECIPE FOR LATER! This drink is the ideal summer drink. Watermelon plus frose? I need this and a seat by the pool. Agreed! I agree that would be the perfect setting for them! Cheers! I am craving this! It looks so yummy. I love watermelon so I will be trying this recipe out this Summer. Thanks so much! It’s a great way to cool off! Cheers! Guess I know what I have to make with my birthday bottle of Rose! I’ve been dying to try a frosé! This looks so yummy! Thanks, it’s pretty tasty! Hope you try it out, cheers! Yes, please! I’m not a huge fan of rose by itself but frose is so perfect for summer and so much tastier! It is actually great with a red wine as well, if you would prefer that! Cheers! My husband loves anything watermelon. I love watermelon, but not watermelon flavored things-so weird! I’ll be making these for him! Haha, I encourage you to try it! 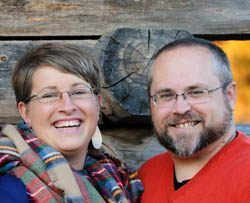 Hope your hubby loves it too! This is the perfect summer treat! I can’t wait to give this a try! Yum – this looks so good!! I love anything watermelon!! I’m bookmarking this recipe to make this weekend while my husband and I sit out by the pool. I’ll bet the flavors are fantastic! I hope you got to try it, and enjoy it! We loved this one, cheers! Agreed, perfect for a hot day anywhere! Cheers! What a great summer drink for by the pool! This sounds delicious! 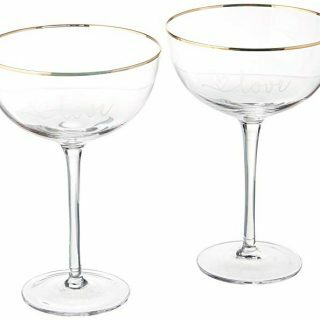 It would be perfect for a summer party! Thanks so much! 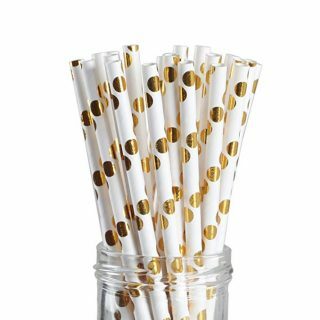 It would be a great party drink! Yum! This is my kind of summer cocktail!! Love the watermelon raspberry combo! Thanks so much! I loved the flavors in this, and the color was so great, too! Cheers! This looks delicious, I am going to have to try this to beat the summer heat! Hope you do! It’s a great way to cool off! 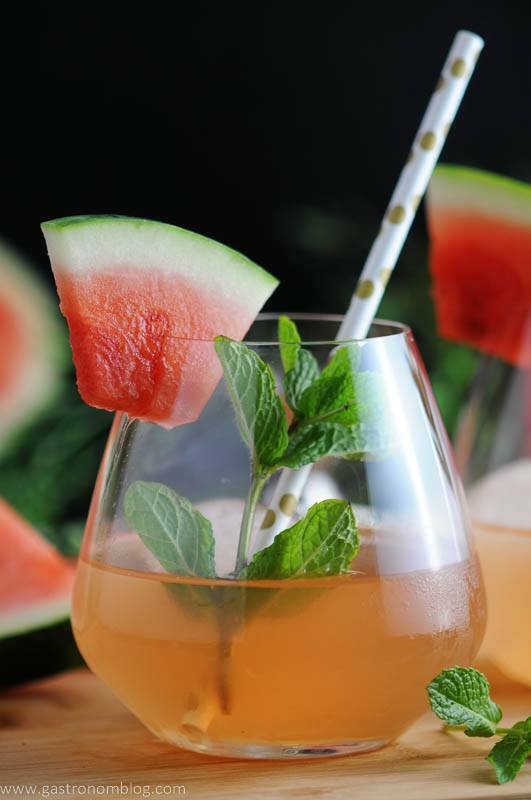 Love this for a summer cocktail! Such a great flavor combo!! This looks so incredibly delicious! One question though, don’t the raspberry seeds make it gritty in texture? I tried raspberry sorbets before and always had to strain the liquid to not make it feel like eating sand. Thanks so much! We really didn’t notice any grit, as the raspberries acted like ice, so it just fit in with the ice pieces really well!